For all parties involved in the act of publishing (the author, the journal editor(s), the peer reviewer, and the publisher) it is necessary to agree upon standards of expected ethical behaviour. 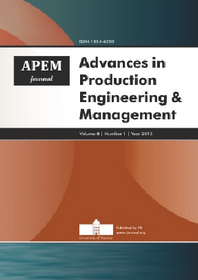 The ethics statements for the journal Advances in Production Engineering & Management are mainly based on the guidelines of Committee on publication ethics (COPE) and the ELSEVIER publishing ethics resource kit. Please see the complete list of sources below.